Survey Statistics: Is a Social Security Disability Lawyer Worth It? 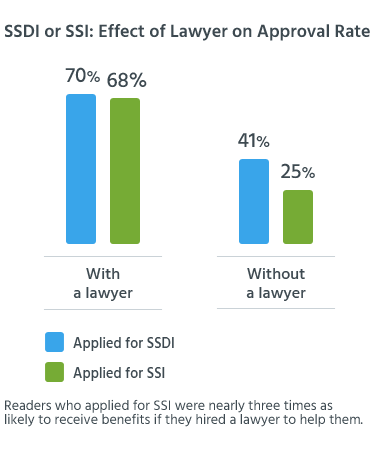 Our survey showed that people who applied for SSDI or SSI were almost twice as likely to get benefits when they hired a disability lawyer. If you’re thinking of applying for benefits from either of the federal programs for people with disabilities—Social Security Disability Insurance (SSDI) or Supplemental Security Income (SSI)—you might be wondering whether you should hire a lawyer to help you with your claim. To find out more about the role of lawyers in obtaining SSDI and SSI benefits, we surveyed readers across the U.S. who recently went through the process of filing a claim and getting a decision. Here’s what we learned about the difference a lawyer can make. That’s the big picture. But you may have other questions. At what point is a lawyer’s help more critical? Does the type of program you’re applying for (SSDI or SSI) make a difference? A closer look at the survey results provides some answers. "My lawyer had many years of experience and knowledge in representing disabled people, was highly recommended by her peers, kept me informed on my case, and could be reached anytime. She knew exactly what questions to ask me at the hearing. Plus she was a very calming presence for me since I was so nervous." Few applications make it through both of these steps successfully. More than three-quarters of our readers reported that their initial applications were denied. But those who had a lawyer’s help did somewhat better. Only about a third of readers (33%) hired an attorney to help them fill out their application and submit it to the SSA. Of those, 28% were approved for benefits at the initial stage, compared to 20% of those who completed the application on their own, without help. This relatively modest (40%) improvement with a lawyer is probably due to a few factors. On the one hand, attorneys know the SSA’s rules, and they know what information and medical evidence needs to be included with the application to meet the SSA’s definition of disability. On the other hand, most applicants get denied at the initial application stage anyway, partly because their medical conditions haven’t yet worsened to the point of disability in the eyes of the SSA. As a result, a lawyer’s help at this stage doesn’t make as much of a difference as it does later (see below). Only a little over half of our readers whose application was denied (52%) requested a hearing before a judge —a figure that’s close to national statistics on appeals. That’s too bad, because people who either gave up or missed the deadline for filing an appeal passed up their best opportunity for getting disability benefits: at a hearing before an administrative law judge. And our survey showed that getting help from a lawyer at this stage improved those chances significantly. First, a bit on the procedure at this stage of the process: After an application is denied, most states require claimants to go through a reconsideration review before they can request a hearing. (For details, see our article on reconsideration of SSDI/SSI denials.) Almost all reconsideration reviews lead to another denial (nearly nine in ten, according to government statistics). But the picture changes significantly when applicants get to the hearing stage. 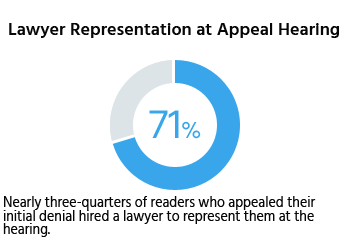 Of our readers who requested a hearing, more than seven in ten (71%) hired a lawyer to help with their appeal. As our survey shows, that was a smart decision: A lawyer more than doubled the chances of a good outcome. Half of those with legal representation (50%) were approved for benefits after the hearing, compared to less than a quarter (23%) of those who represented themselves. When we view the survey results from another perspective, we see that readers who didn’t get a lawyer’s help were only slightly more likely to win benefits at the hearing stage than at the initial application. knowing how to cross-examine the vocational expert in order to strengthen your case. Does the Type of Disability Make a Difference? There are big differences between SSDI and SSI, even though the SSA administers both programs. SSDI is a type of insurance for people who’ve worked and paid taxes for years before becoming disabled. In contrast, SSI is a need-based program for disabled people with little or no income or assets, regardless of their work history. Our survey shows that SSI applicants generally have a more difficult time getting benefits than SSDI applicants. (For details, see our survey statistics on SSDI and SSI.) A lawyer’s help makes a significant difference regardless of the program, but the attorney advantage is especially big for SSI applicants. Readers who applied for SSI and hired an attorney at some point in the process (usually for the hearing) were nearly three times as likely to win an approval as those who proceeded without a lawyer (68% compared to 25%). It isn’t easy to get Social Security disability benefits. As anyone who’s been through it can tell you, it can be a long, exhausting process. But our survey reveals two important points that provide hope: Don’t give up if your application is denied at first, because approval rates go up at the hearing stage. And if you want to increase your chances of success, seek the help of an experienced disability lawyer. 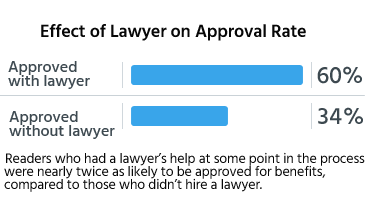 We also asked readers how they felt about their lawyers overall. The results seemed to be a reflection of the improved outcomes with legal representation. 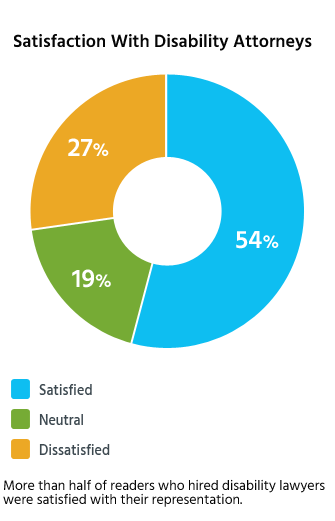 More than half of our readers (54%) said they were satisfied or very satisfied with their attorneys, while more than a quarter were dissatisfied on some level. When we looked more deeply at who was more likely to be satisfied with their lawyers, the results weren’t surprising: Readers who ultimately got benefits were much more likely to be happy with their legal representation (71%). Also, readers were almost 20% more likely to be satisfied with lawyers who didn’t take any payment for their help. We also asked readers why they were or weren’t satisfied with their lawyers. For those who weren’t happy about the experience, the most common response by far was some variation on communication problems: lawyers who didn’t stay in touch, keep applicants informed about the progress of their case, and/or promptly respond to their questions. Readers who rated their lawyers positively most often mentioned their helpfulness, professionalism, and knowledge.